Saxophone phenom Melissa Aldana & her Crash Trio are spending their Valentine’s Day in Columbus. On Saturday, February 14th at 8pm, join Aldana, the first woman to win the instrumental portion of the Thelonious Monk International Jazz Competition, and her trio for their performance at the Wexner Center for the Arts. At the age of 25, Aldana had already recorded two solo albums (Second Cycle, 2012 and Free Fall, 2010) when she and Crash Trio (Pablo Menares, bass and Francisco Mela, drums) released their self-titled debut in 2014. 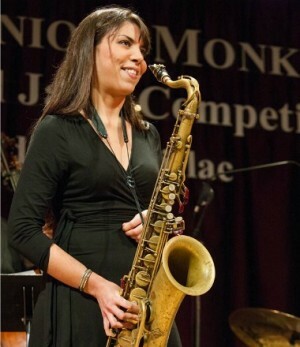 Aldana learned to play the sax in her hometown of Santiago, Chile, where she became a regular headliner at local jazz clubs. After coming to the US, she attended the Berklee College of Music in Boston and soon migrated to the jazz metropolis of New York City. While she often weaves her Latin roots into her music, she is recognized for being an accomplished disciple of many of the classics. She credits Sonny Rollins for her switch from alto sax to tenor when she was just a child. Aldana’s standout feature is considered to be her signature sound, which shines through not just on her own compositions but on her renditions of traditional hits as well.